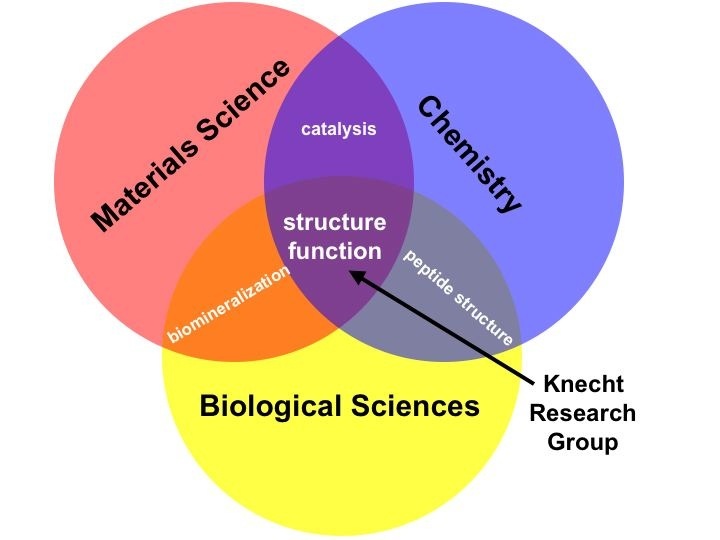 Research in the Knecht Group is truly interdisciplinary in nature. We draw on the expertise of a wide background of research areas to develop materials for specific applications. These areas include, but are not limited, to chemistry and biochemistry, materials science, and biological sciences. Many projects have been developed that focus on this interesting area of research and are being actively studied. See below for more information about specific projects. The development of green and energy efficient catalytic materials is critically important as the exhaustion of fossil fuels approaches. While standard catalytic designs have demonstrated positive progression towards these goals, new materials must be developed and designed that are fully active under such non-traditional conditions. Bio-inspired nanomaterials have demonstrated some unique abilities under these conditions owing to their peptide surface passivants, which are optimized under ambient and biological-based conditions. 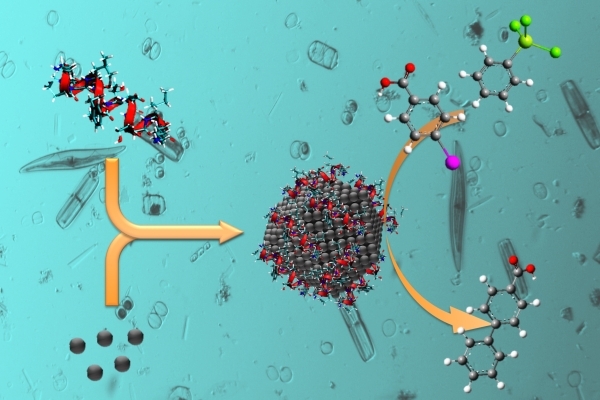 We have used such approaches to develop nanocatalysts using a Pd specific peptide that operate in water at room temperature, that emply 0.005 mol% Pd for quantitative yields for Stille coupling. These results position the peptide-based nanocatalysts as unique model systems for understanding the reactive designs for the generation of enhanced catalytic species. Present studies are being conducted to probe these dimensions. In order to employ biomolecules as active surface species for nanomaterials, it is important to understand these interactions at a molecular level. We have begun to study these properties employing citrate-capped Au nanoparticles in solution using simple amino acids to monitor surface changes that may arise. By studying the interactions between these two species, we have observed incomplete surface ligand exchange between citrate and Arg, which results in the self-segregation of the two species to produce an electronic dipole across the surface. As a result, linear assembly of the Au nanoparticles occurs that is dependent upon the Arg concentration. We use this effect to monitor surface exchange rates as well as the binding efficiency of biomolecules.